SoundMet is a BS Stainless trademark, it is an acoustic insulation product targeted at improved noise attenuation and reduction of labour costs. 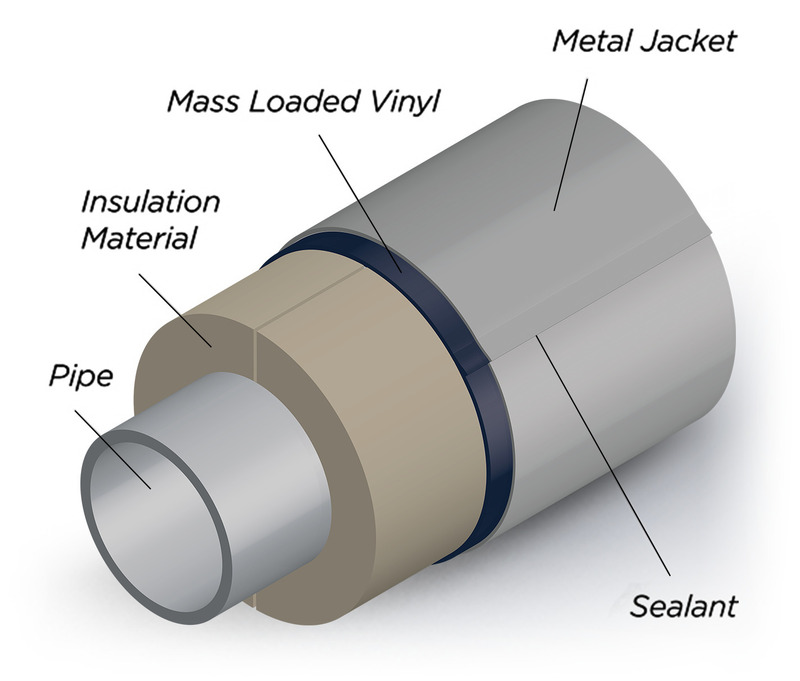 SoundMet is essentially a Mass Loaded Vinyl (PVC loaded with Barium Sulphate) layer bonded to the base metal. Laminating the Vinyl with metal integrates the application of 2 separate components of insulation system – MLV and Jacketing Metal into one application of SoundMet, this allows substantial savings in Man Hour. MLV is also referred to as mineral loaded vinyl. The product can achieve the required sound transmission class (STC) to meet the clients demands. Offers better acoustic performance than the 2 products fixed inde­pen­dently. Huge reduction in labour fixing time and ease of application. Faster install time results in less time on site for installers and less exposure to moisture of open system. Reduction in fixing materials such as sealant, banding and wing seals. Easy to bend and form including 90 degree bends, also can be rollformed / corrugated. Full control of the material integrity manufactured under strict factory controls to meet ISO, ASTM, EN standards. The product can be re-engineered to suit specific applications for example ultra low temperatures of minus 50 deg C or for High temperature applications 100 deg C and more, it has the flexibility to be supplied on multiple metals such as stainless steel, Aluminium, Stuuco embossed aluminium, Aluzinc and more. Other varients can be produced to meet stringent fire regulations such as AS 1530.3 1999, ISO 3795 and FMVSS 22. It can be supplied with outer coatings such as paint PVDF (COOLMET) or Tedlar, (TEDMET). Material is supplied in coil form in flexible weights and thickness range from 0.25mm – 1.2mm dependent on material. In addition to supplying this as a laminate of stainless steel and Mass loaded vinyl or Aluminium, we can also supply mass loaded vinyl with an adhesive backing Soundmat. 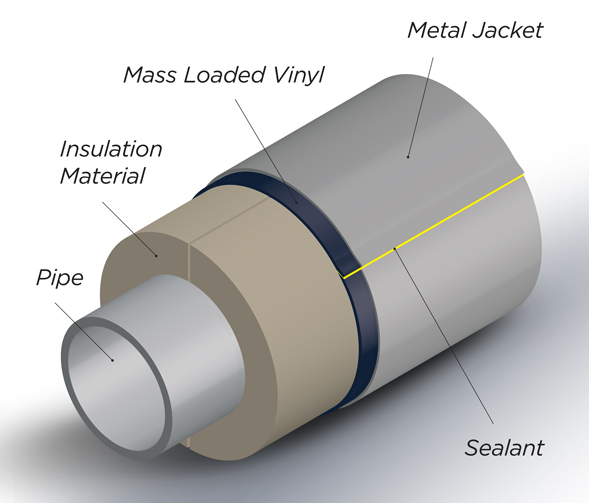 Or as an antivibration laminate Vibromet, SoundMet is mass loaded vinyl which is machine laminated to a continuous roll jacketing, the jacketing can be aluminium or stainless steel. So a typical demand maybe 0.5mm / 0.020" thick Aluminum, laminated to 5kgs / 1lb/ft2 mass loaded vinyl or 0.8mm / 0.032" Stainless Steel laminated to 5kgs / 1lb/ft2 mass loaded vinyl this is a common specification we manufacture to meet the demands of popular FEED and EPC requirements for international projects. We can also supply these as standard listed below but other unique thicknesses can be manufactured to meet specific acoustic demands. 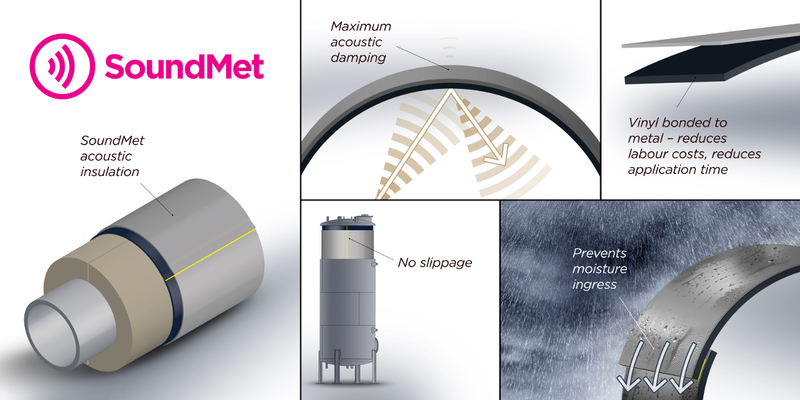 *For more details on SoundMet® and to request samples, please contact one of our engineers, data sheets are available from the website to download extensive test data available on request.